Elon Musk’s plan to dig 18-mile-long underground tunnels between Chicago’s Loop and O’Hare International Airport was never a done deal, and after the February 26 mayoral election to replace Rahm Emanuel, the project may never be realized. On the surface, Musk’s pledge to fund the $1 billion high-speed train system through the Boring Company at no cost to the city seems like a win-win, but as a new report from The Verge revealed, momentum may be building against the O’Hare Express System. With Mayor Emanuel on his way out, his pet project might not survive. 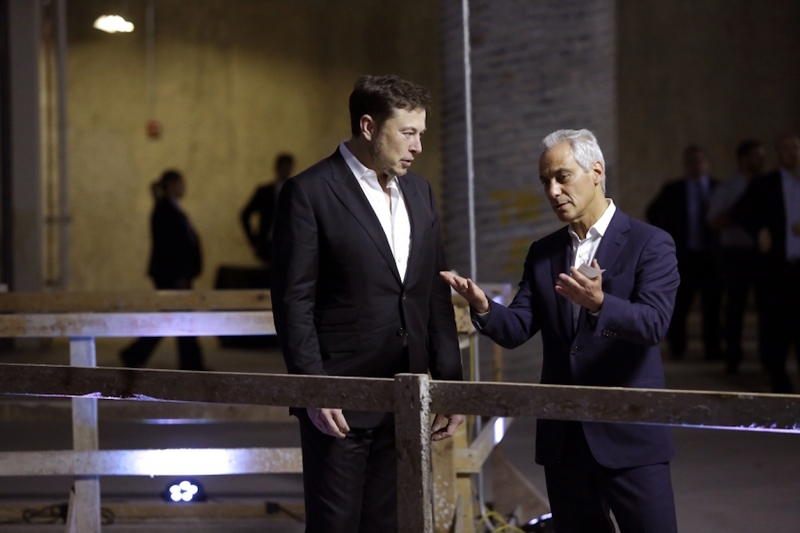 As the Verge noted, Emanuel hasn’t used his veto power once in his nine-year tenure as mayor, and Musk had chosen Chicago for the first practical application of Boring Company technology thanks to the permissive regulatory atmosphere. The plan went public in June last year, but no firm details on what the city has agreed on have come out yet and at least one lawsuit has already been filed to release any public records. It appears that public communication on the project has gone silent, and an official contract between the Boring Company and nonprofit Chicago Infrastructure Trust—a body created to facilitate public-private partnership projects—has yet to materialize. The Boring Company can’t sign a contract with the city until a National Environmental Policy Act review is complete, but the review can’t commence unless the Boring Company releases concrete project details. The tunneling company may be laying low until after the election. Other than the mayor’s departure, the city council has been hit with a set of scandals that have made it reluctant to vote on new projects. Alderman Ed Burke was arrested in an FBI raid last month on charges of extortion—a raid made possible thanks to fellow alderman Danny Solis, who wore a wire for two years as part of the investigation. Now, Solis is retiring and refusing to vote on any development in his district until his replacement is elected, meaning that the council is down two members who have historically voted in lockstep with Mayor Emanuel. Of the 15 candidates on the ballot for mayor, many of them appear opposed to the high-speed rail line. The project was a point of contention at a candidate forum earlier this month, and many of the surveyed mayoral hopefuls told the Chicago Tribune that they would consider quashing the tunnel. Only candidate Bill Daley provided support for the rail tunnel, and even that was measured, as he called for a thorough evaluation of the project's cost. Many of the concerns were about the untested nature of the technology being used, as the Boring Company has only completed one test tunnel thus far, as well as cost and density concerns. 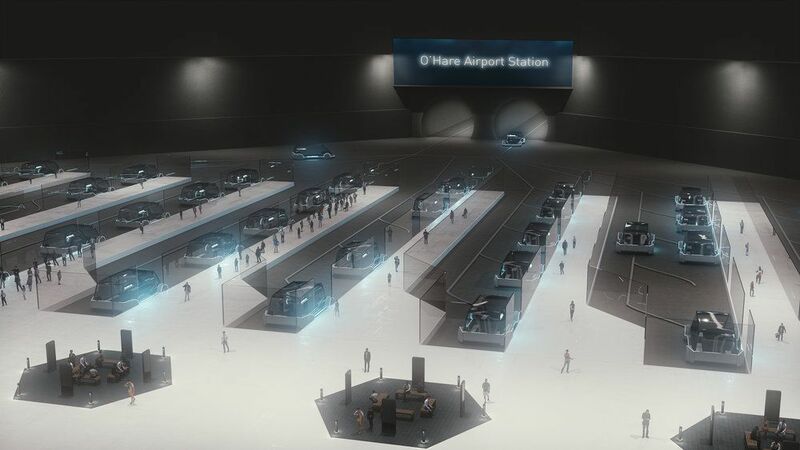 While electrically-powered shuttles would be able to move people downtown at 150-miles-per-hour and cut transit times from Block 37 in the Loop to O’Hare to only 12 minutes, the system would only be capable of moving 1,900 people per hour. Tickets could cost up to $25. For comparison, the Blue Line is able to move twice as many people per hour along that same route for only $5. Elon Musk’s woes aren’t slowing down, as Bloomberg has discovered that the Trump administration’s proposed U.S.-Mexico border wall would cut through the SpaceX launch facility in Boca Chica, Texas. The 50-acre facility, which received $20 million in incentives from the Texas state government, is being used to build and test a new spacecraft called the Starship, which Musk hopes will one day deploy from a SpaceX Falcon rocket and ferry passengers to Mars. 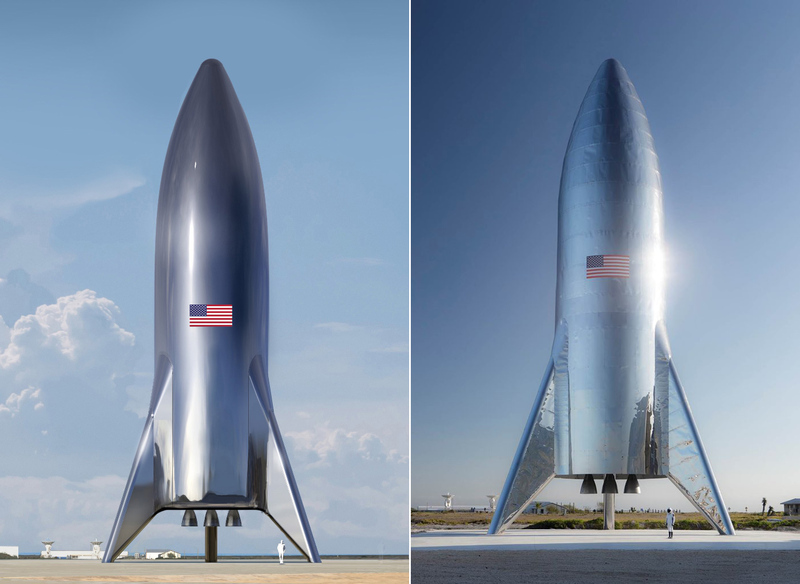 The reusable, stainless-steel clad shuttle has been in the news recently for ignoble reasons, namely because it was knocked over by the strong Southern Texas winds last month. According to documents from the Department of Homeland Security (DHS), the border wall would cut directly through a SpaceX launchpad. Rio Grande Valley representatives are pushing to have the facility exempted from any border wall construction, but SpaceX has been conspicuously quiet—a company official told Bloomberg that SpaceX is trying to lie low and avoid drawing DHS’s attention. “The Department of Homeland Security and U.S. Customs and Border Protection recently requested SpaceX permit access to our South Texas Launch site to conduct a site survey,” James Gleeson, a SpaceX spokesperson. “At this time, SpaceX is evaluating the request and is in communication with DHS to further understand their plans.” As negotiations over the fate of the border wall drag on (and break down), it remains to be seen whether lawmakers will be able to come to a compromise over border funding before February 15. After the record-breaking 35-day partial government shutdown was temporarily halted to give the House, Senate, and President time to maneuver on border security, it now appears that, if no agreement is reached, border wall construction could begin via a national emergency declaration. Regardless of whether Congress allocates $2 billion, the full $5.7 billion, or nothing, border wall construction has been previously funded in fits and starts. Even as deliberations in Washington drag on, the National Butterfly Center (also in the Rio Grande Valley area) filed an emergency restraining order this week as excavators began laying the groundwork for a 36-foot-tall wall that would cut through the nature sanctuary. After over two years of internet-fueled hype and fast-paced construction, erratic billionaire Elon Musk has unveiled a prototype tunnel outside Los Angeles that aims to test his far-fetched vision for a new urban transportation network below the region’s notoriously traffic-choked streets. The so-called Loop project is envisioned as a series of tunnels that could ferry private automobiles, and pods carrying pedestrians and bicyclists at speeds approaching 150 miles per hour. The tunnels, accessible from a network of parking spot-sized lifts, could eventually connect the city’s major landmarks and neighborhoods, according to a preliminary map unveiled last year. https://twitter.com/boringcompany/status/1075318894871470081?s=21 The Boring Company–backed test tunnel took shape beneath a neighborhood sandwiched between a municipal airport and Interstate 110 in Hawthrone, California, where several of Musk’s companies are headquartered. Although the test tunnel debuted with several key design changes—including the elimination of so-called “skate” platforms that private automobiles would ride on and actual travel speeds that barely approached 50 miles per hour—the bumpy debut was met with cautious optimism by observers, according to The Los Angeles Times. With a reported cost of about $40 million, the roughly mile-long test tunnel was built for a fraction of the cost of conventional subway technologies, though that is not exactly an apples-to-apples comparison, given the tube’s diminutive size relative to conventional transit routes, the fact that it was not built with unionized labor, and its overall reduced passenger capacity. According to The New York Times, Musk referred to the tunnel as “a real solution to the traffic problem we have on earth,” adding, “It’s much more like an underground highway.” The opening of the test tunnel follows the high-profile setback for Musk’s plan to build a second tube underneath the streets of the City of Los Angeles that came last month. The Boring Company is also working on a tunnel that would connect downtown Chicago with O’Hare Airport as well as a more modest loop that could potentially link L.A.’s existing subway system with Dodger Stadium. After settling a lawsuit with community groups in Los Angeles this week, Elon Musk’s Boring Company has agreed to halt its plan to build a 2.7-mile test tunnel underneath the city’s Westside. The lawsuit was filed following a preliminary approval from the Los Angeles City Council that would have shielded the project from stringent environmental review. After the approval, community groups began to fight the project, arguing that rather than building a test tunnel, Boring Company was actually pursuing “piecemeal” approval of a larger transportation project in an effort to minimize the appearance of its impact. The group argued that the City of Los Angeles violated California law in its initial approval. The terms of the now-settled lawsuit are confidential, The Los Angeles Times reported but the parties involved issued a joint statement saying they had “amicably settled” the matter. The Boring Company has agreed to cease planning on its test tunnel and will instead, according to the statement, focus on a recently-proposed plan that would link Dodger Stadium with regional transit via a scheme similar to the one proposed for the Westside. The so-called Dugout Loop would link the isolated stadium to the regional Red Line subway. The plan is supported by Los Angeles mayor Eric Garcetti and comes as a separate group works to create a gondola line connecting the stadium to Union Station in Downtown Los Angeles. 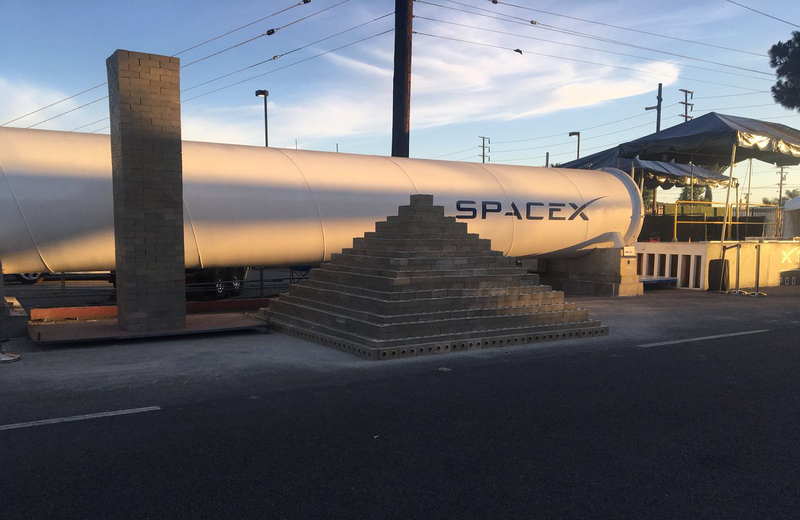 Boring Company has been busy working on another test tunnel in the City of Hawthorne, where the company is headquartered. Musk recently announced that the test tunnel was complete and would open to the public in December. Musk also announced that he would be making good on an earlier promise to use excavated dirt from the tunnel to fabricate bricks for affordable housing projects. To push the initiative forward, Musk launched the so-called Brick Store where blocks will be available for 10 cents apiece to the public. The bricks will be free for affordable housing builders, according to Musk. Elon Musk’s Boring Company has completed its first tunnel, breaking through the other side of a 2-mile-long test track that began in the parking lot of Space X’s Hawthorne, Los Angeles, headquarters. 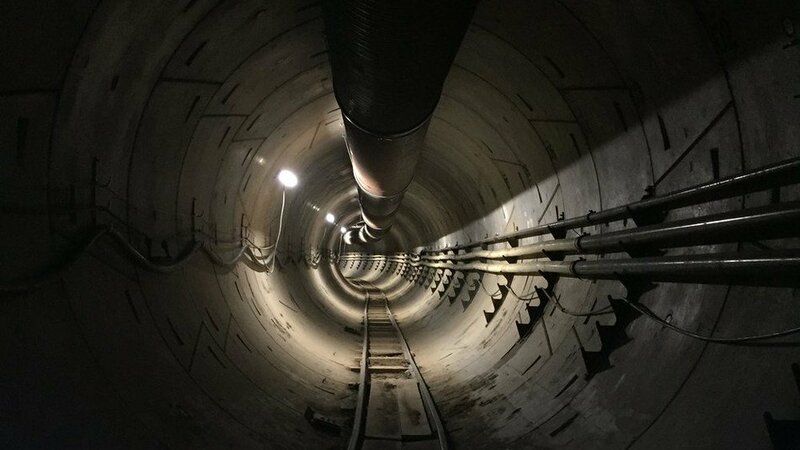 Musk took to Twitter and posted a video of their tunnel boring machine breaking through the track’s final wall in what will eventually become the “O'Leary Station” for a Hyperloop network, though as Arstechnica notes, the location isn’t exactly where the Boring Company had received approval to build a station. Now that the tunnel is complete, the L.A.–Hawthorne tunnel is on track for its December 10 opening date. Although Musk originally envisioned a Hyperloop-style system that would ferry cars under Los Angeles’s traffic-congested highways at 155 miles-per-hour, he later pivoted toward accommodating bikes, buses, and pedestrian traffic as well. This is the same style of system that the Boring Company was selected to build in Chicago to connect O’Hare and the Loop—though that deal is currently facing an injunction from the nonprofit Better Government Association. But what about the refuse that the Boring Company has excavated? Musk first proposed converting tunnel waste into bricks that could be used for affordable housing back in May, claiming that the stone they were mining was “seismically rated” in California. Then, in September, Musk promised that a “Boring Brick store” would be opening in two months and selling bricks for 10 cents each. Now, it looks like Musk is following through with his promise and has founded The Brick Store LLC. From public documents submitted in October, the Brick Store will open at 12003 Prairie Avenue in Hawthorne, only a mile from the Space X headquarters (and aforementioned Hyperloop tunnel). While it’s uncertain exactly how many bricks the Brick Store will be able to offer, Musk has promised that he’ll give them away for free to affordable housing projects. Before the tunnel officially opens next month, the Boring Company will need to extricate their tunnel boring machine using the access shaft and clean up the rubble left behind. Musk claims that the Boring Company will eventually dig tunnels all the way to residents’ private garages. 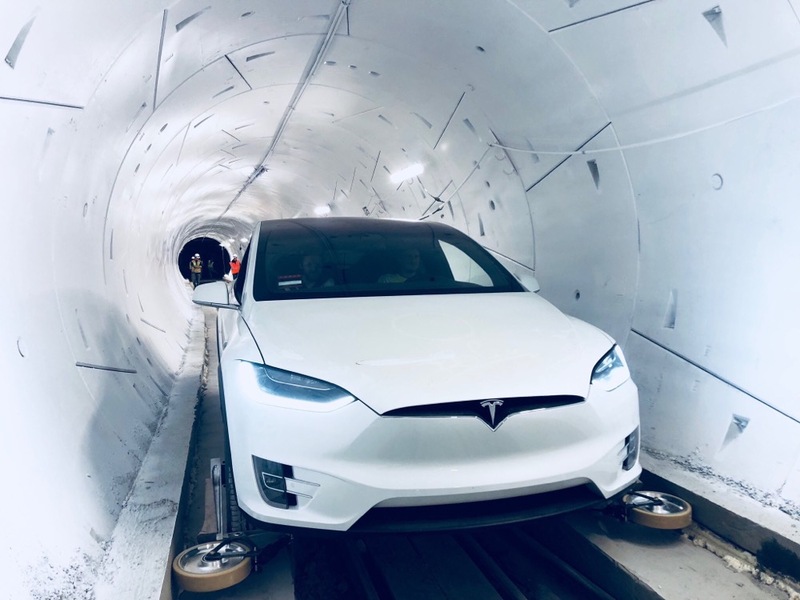 Elon Musk has continued his streak of sharing big news via Twitter: on Sunday, he announced that the Boring Company's first Los Angeles tunnel would open on December 10 and offer free rides to the public the following day. The 2-mile tunnel was carved out under Musk's Space X headquarters in Hawthorne and follows 120th Street, and is a test run for what Musk hopes will be a tunnel network that runs underneath the entire city. The high-speed system, which Musk tweeted would run at 155 mph, was originally intended for private cars but will now be designated for public transit, pedestrians, and cyclists. This is not the only tunnel that the Boring Company has undertaken in L.A.—another 2.7-mile route is being dug under Sepulveda Boulevard, which bypassed California's strict environmental review process—but this would be the first tunnel that to be completed. 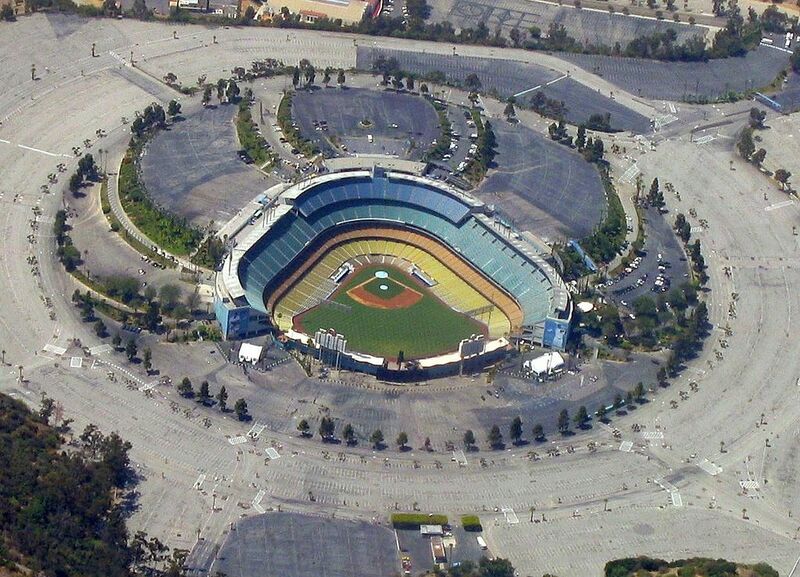 Musk also proposed a 3.6-mile-long "Dugout Loop" that would take riders from Los Feliz or East Hollywood to the Dodger Stadium in four minutes, for which the company held a sparsely attended public hearing in August. Of course, beyond Musk's company's ability to deliver on his grand promises, the feasibility of the Loop system proposed by Musk will be dependent on passing the state's environmental review and other approval processes. The Sepulveda-adjacent tunnel also faced community opposition, with officials in Culver City also considering a legal challenge. Will Musk's eventful summer be capped by the successful opening of a tunnel that improves Los Angeles commutes? Only time will tell. The Boring Company has released yet another underground transit proposal for Los Angeles. Wednesday night, embattled Boring Company CEO Elon Musk announced the so-called Dugout Loop, a proposed “zero-emissions, high-speed, underground public transportation system” that could potentially ferry passengers between the Red Line subway and Dodgers Stadium. The company released a series of possible proposals, with variations on route length and station origination point. The ultimate aim of the proposal is to improve travel times between the East Hollywood, Los Feliz, and Rampart Village neighborhoods and the stadium, which is roughly 3.6-miles away. Boring Company estimates that the proposed loop would be able to complete a one-way trip in roughly four minutes and carry between 1,400 and 2,800 passengers per day, roughly the same number as are currently transported by the express Metro buses that currently operate between the stadium and Union Station using dedicated bus lanes. Here’s the hitch: Unlike conventional transportation systems that convey passengers in both directions simultaneously, Musk’s link would only be able to operate in one direction at a time. The limiting arrangement is a result of the small diameter tunnel that is being proposed for the route, similar to that of other Boring Company tunnels proposed for western Los Angeles and Chicago. The proposal comes after a week of questionable business decisions and erratic tweetstorms from Musk, and as L.A.’s Metro makes plans to embrace a proposed $125 million gondola system connecting the Union Station in Downtown L.A. with the stadium. Backers for the gondola plan include former Dodgers owner Frank McCourt; Estimates for the transit link indicate the gondolas could ferry as many as 5,000 passengers per hour, with traffic moving in both directions simultaneously. Musk recently drew criticism and accusations of project “segmenting” for bypassing environmental review as the Boring Company attempts to move forward with a portion of a proposed Hyperloop route through L.A.’s Westside neighborhoods. Neighborhood groups outraged by the effort successfully sued to block the project. The proposal also comes as the Boring Company faces legal challenges for a similarly-vague proposal issued for Chicago that would link the city with O’Hare Airport. Elon Musk’s plans to build an underground express system for Chicago are super vague and people are mad about it. The Illinois-based Better Government Association (BGA) announced in a report yesterday that it’s filed a lawsuit against the city to release public records behind its $1 billion deal with the Tesla CEO. In June, Mayor Rahm Emanuel and Musk unveiled their grand vision to create a tunnel that would allow commuters to traverse 15 miles from the Loop in downtown Chicago to O’Hare International Airport in just 12 minutes. Musk promised to use untested digging equipment to build it and to introduce the new electric rail system in as little as 18 months. But that’s pretty much all that's been publicly revealed about it. The BGA argued that the secrecy behind the proposal’s logistics goes against the statutes of public policy that require such developments to solve clear problems in a clear way before receiving approval or funding. The watchdog organization reached out to the Emanuel administration to obtain public records detailing the meetings between the mayor and Musk, but the city simply claimed the initial discussions on the project were “pre-decisional.” This means no firm deal has been struck between the two parties even though the plan went public this summer. The BGA also pointed out that Musk has already completed a short tunnel project beneath Los Angeles’s Hawthorne neighborhood, but used conventional sewer drilling technology to make it, not the as-promised, untested tech. Musk claims that he can begin construction on the Chicago tunnel by the end of this year and complete it quickly thanks to the new (non-existent) digging equipment. But the head of the Chicago Infrastructure Trust, which green-lighted the project according to the BGA, said a more realistic construction time is four years. Even so, major infrastructure projects generally take a decade or more to finish (see: New York’s Second Avenue Subway) and Chicago has already spent over $250 million under former Mayor Richard M. Daley on a failed plan to complete an underground superstation on the way to the airport. Improving upon the 45-minute commute via rail from the Loop to O’Hare is a top priority for the city, but no real plans from Musk or the mayor have been outlined as of late for locals to review. If the BGA’s lawsuit moves forward, Chicagoans could get a peek at the plans sooner rather than later. Production on Tesla’s highly-anticipated solar roof tiles is currently stalled due to aesthetic quality concerns and assembly-line problems at its Buffalo, New York, factory, according to Reuters. In an article published last week, Reuters interviewed eight former and current employees at Tesla, Inc. and their joint venture partner Panasonic, who revealed that the future of solar tile production is murky at this time. According to Reuters’s unnamed sources, since opening last year, manufacturing at Tesla’s Gigafactory 2 in Buffalo has suffered repeated interruptions with equipment issues and delays in achieving the tile style CEO Elon Musk is seeking. The state-owned, photovoltaic cell factory, leased by Tesla’s subsidiary SolarCity, currently employs around 600 people. After the prototypes of Musk’s sun-powered roof tiles were revealed two years ago, U.S. customers put down $1,000 deposits and production ramped up at the facility. Tesla told Reuters in a statement that though production has slowed, work can be expected to increase later this year. “We are steadily ramping up Solar Roof production in Buffalo and are also continuing to iterate on the product design and production process,” Tesla said. “We plan to ramp production more toward the end of 2018.” Per the subsidy agreement that allowed Tesla to build the $350 million factory and purchase production equipment, the company has to live up to its investment and employment promises in Buffalo and beyond. New York lawmakers are skeptical that the company can achieve the mandates the state and the company have set. At least 1,460 people must be employed by Tesla within the first two years of opening, and the company must spend $5 billion in New York over the next ten years. Panasonic employees told Reuters that their current production on solar products has been delayed as well, but it’s due to pick back up in September. The company has also started selling to outside buyers since Tesla has yet to integrate their designs as promised. According to a source, Tesla is currently working with JA solar to address Musk’s aesthetic concerns with the tiles. Ahead of a formal announcement later today, the Chicago Tribune has confirmed that Elon Musk’s The Boring Company has been chosen to dig a high-speed train route from Chicago's Loop to O’Hare International Airport. Mayor Rahm Emanuel’s administration has selected Musk to build out an underground rail system from Block 37 in the Loop to O’Hare, potentially cutting the transit time from an hour by car or 40 minutes on the Blue Line down to 12 minutes each way. The route is part of the recently announced $8.5 billion O’Hare rehabilitation. Under Musk’s proposal, The Boring Company would dig two tunnels along an as-of-yet undetermined route under the city, and transport passengers in autonomously-driven pods that would “skate” on electrified rails. Each pod would carry up to 16 passengers, and Musk has promised that pods would leave each station every 30 seconds. The promotional video for the proposal seems nearly identical to the one Musk previewed in March for traveling to the LAX, except with different station names. While no timeline has been proposed yet, the Tribune reports that unnamed sources have cited the potential cost as under $1 billion. The Boring Company will be paying for the project out of pocket using revenue from advertisements, the $20 to $25 ticket costs, and selling merchandise on the trip itself. Boring will also fund the construction of a new station at O’Hare and finish the scuttled Block 37 station, and ownership of the tunnels themselves is currently an open question. Boring has pitched the system as being buried 30 to 60 feet underground with 12-foot-wide tunnels, but there are still serious feasibility hurdles that will need to be cleared before the project gets the go-ahead. The route still needs to be approved by Chicago’s City Council, and Boring technically hasn’t completed any full-scale route yet. While the company is building out a similar network of tunnels in L.A. and has received an exploratory permit for their D.C. to NYC hyperloop, the autonomous pods being proposed haven’t been tested in real-world conditions. Another concern is capacity; a 16-person pod stopping every 30 seconds means that the system would run at a capacity of about 1,900 passengers per hour. For comparison, the Blue Line, which Boring’s link is meant to compliment, likely handles twice as much hourly traffic for $5 each way. For New Yorkers, it’s no secret that the MTA is rapidly deteriorating. Practically defined by delays and diversions—and not to mention the impending L train shutdown—the financial and political behind-the-scenes of the subway system has come under increasing scrutiny. 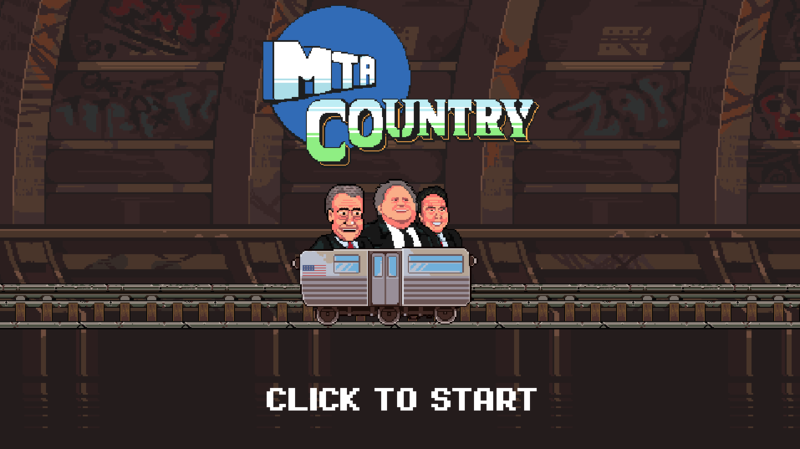 While numerous articles, commentaries, reports, and angry tweets have been published on the state of the MTA and its causes, Everyday Arcade has released what might be the first video game on the crumbling system, MTA Country. Styled after a classic Nintendo-style platformer (its name references the 1994 SNES game Donkey Kong Country), MTA Country is a ride through a roller coaster of subway tunnel. For players, the goal of MTA Country is to get its main character, Gregg T (Gregg Turkin, a lawyer, NYPD Legal Bureau member, and much meme-ified face of the NYPD’s “If You See Something, Say Something” subway campaign) to work. Luckily, he has help from his friends Bill (de Blasio) and Andrew (Cuomo). After watching the trio be launched from a trashcan, gamers can ride down tracks collecting coins as they leap over track fires, stopped trains, broken rails, the notorious Pizza Rat. Graffiti in the background reads “Giuliani was here,” among other commentary. Without giving away any spoilers, users skilled enough to collect all the letters that dot the tracks will be in for a special high-speed transformation à la Elon Musk and rocketed off to a new destination. Luckily for New Yorkers, MTA Country also works on your phone, making it an ideal way to pass time when your train inevitably gets stuck.